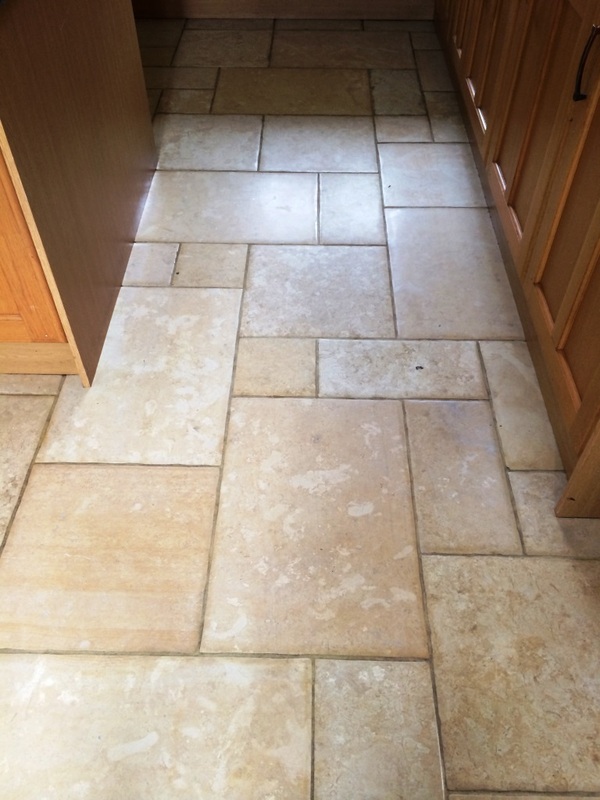 The owner of this house in Nunton near Salisbury got in touch to take a look at the grout lines on their Travertine and Limestone tiled floors which were becoming increasingly dirty and the tiles has started to take on dirt also. We offer a free no obligation survey so I went along to take a look and whilst there did a test clean which worked out really well so they booked us in straight away. 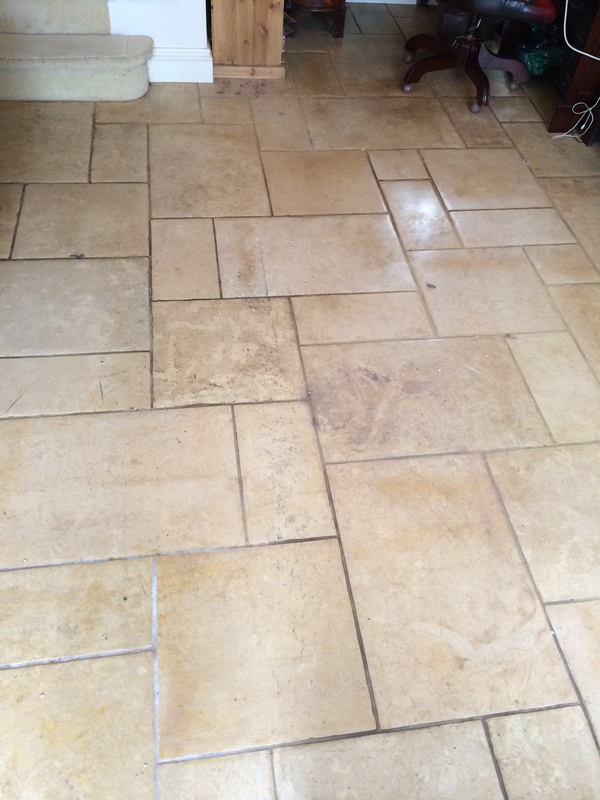 We started by applying a mild dilution of Tile Doctor Pro-Clean which was spread over the floor with particular attention paid to getting the solution into the grout lines. 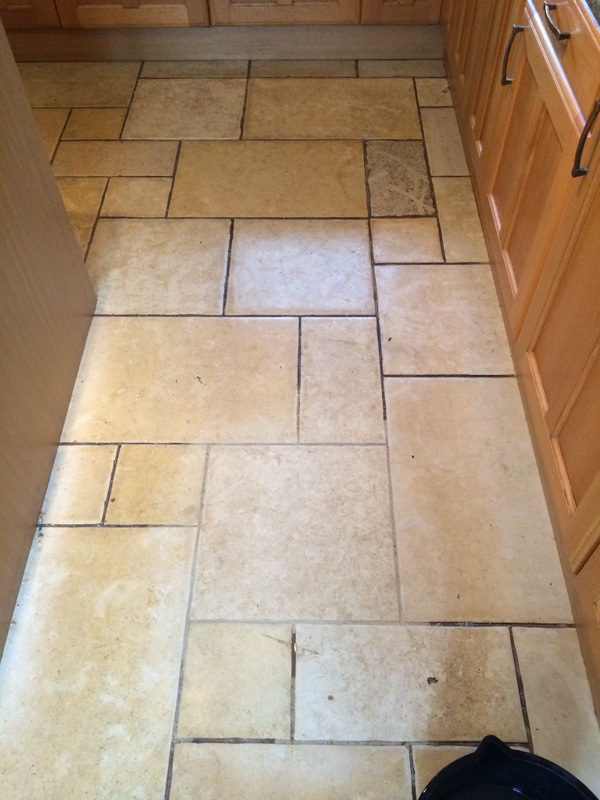 The solution was left to dwell for 10 minutes in order for it to soak in and eat through any dirt and existing sealer; we then used a stiff grout brush to scrub each and every grout line. Next we removed any trace of product by using a wet vacuum and rinsing thoroughly with clean water. 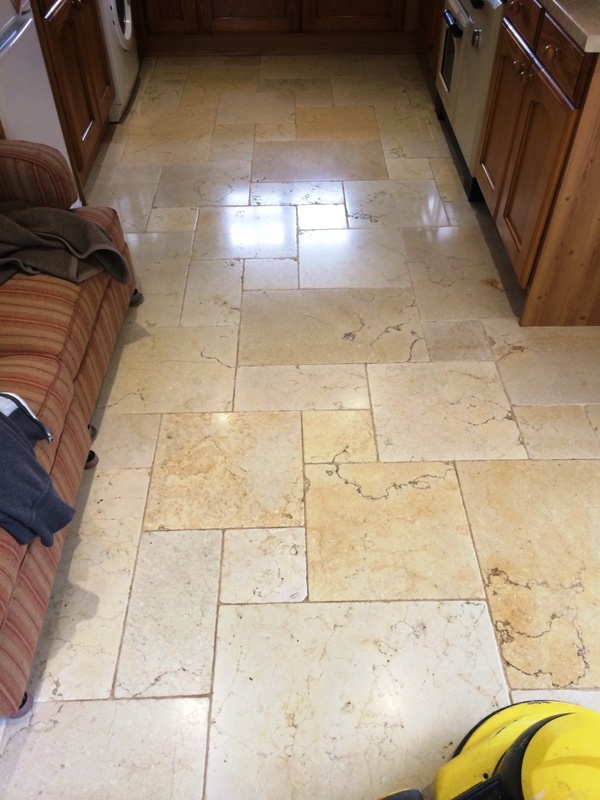 Our next step was to use our diamond encrusted burnishing pads which attach to a rotary machine and burnish the floor with four different grits from coarse to super fine. First using course pad number 1 we put some clean water on the floor and using our rotary machine slowly burnished the area making sure that we passed over each tile 4 times, this coarse pad cuts into the surface grime of the floor and also removes sealers. The resultant slurry is rinsed away with clean water which in turn is removed using a wet vacuum. This process is then repeated with the remaining pads, rinsing between each pad until a nice polish is built up on the tile. The floor is then given a final rinse and once we were satisfied that all the slurry had been removed we left the floor to dry overnight. Upon our return we first completed a damp test using a damp meter to make sure the floor had dried sufficiently for sealing. The floor was fine so we started by polishing the surface using a green polishing pad attached to a rotary machine. 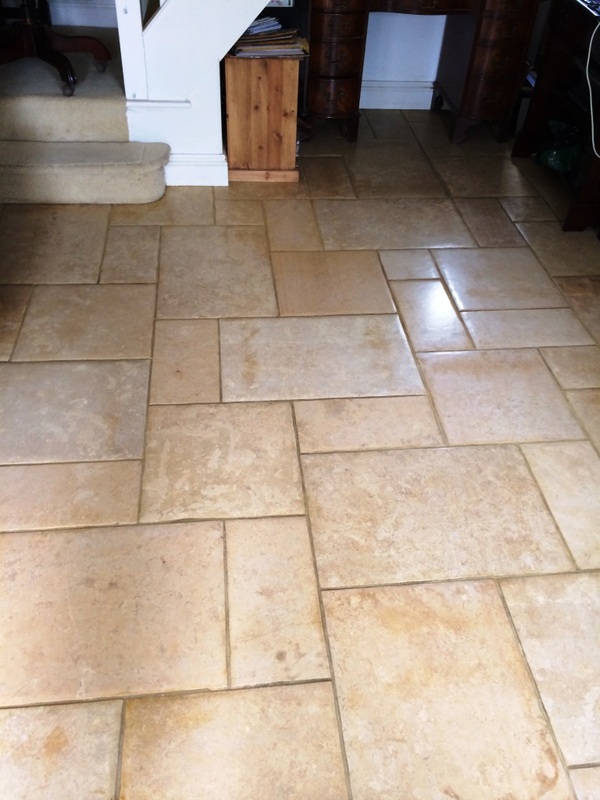 We then sealed the floor using single coat of Tile Doctor Colour Grow which is an impregnating sealer that will occupy the pores in the stone to prevent other contaminates getting in there, Colour Grow also brings out the colours in the stone especially the browns in Travertine. 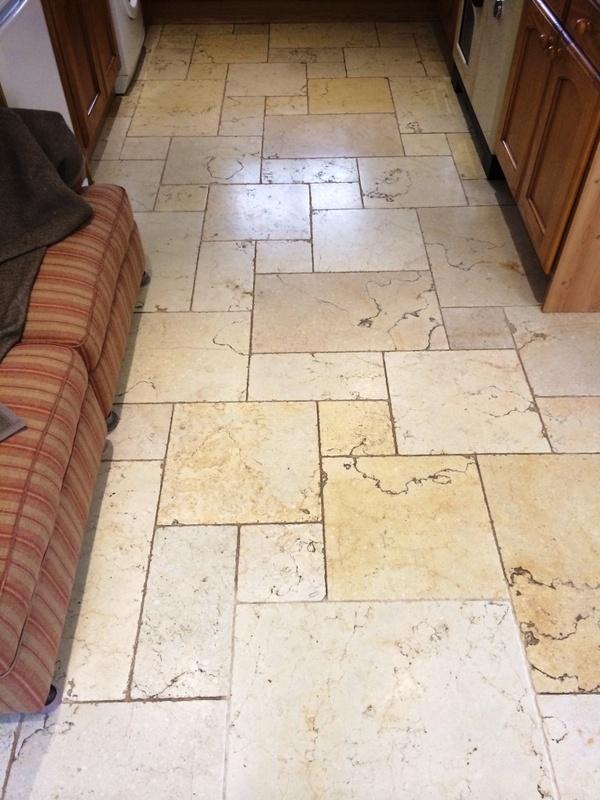 Once the sealer had dried a white buffing pad was attached to the rotary machine and the floor buffed to a nice shine.